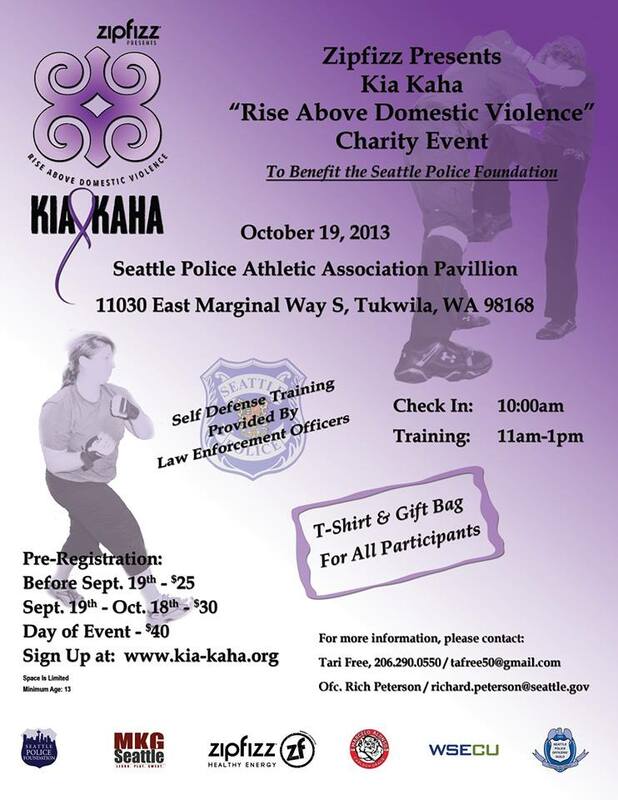 MKG Martial Arts is proud to sponsor, promote and help instruct with the Seattle Police Department at the Kia Kaha “Rise Above Domestic Violence” Charity Event presented by Zipfizz. It is a self defense themed fundraising event designed to bring awareness to Domestic Violence and Human Trafficking here in the Puget Sound area. Domestic Violence is a pattern of abusive behavior in any relationship that is used by one partner to gain or maintain power and control over another partner. 1.3 million women are victims of physical assault by an intimate partner each year. The term “Kia Kaha” means “Forever Strong” and is used in New Zealand as an expression of encouragement and inspiration in the face of adversity. In 2009, the Seattle Police Department’s Integrated Combat and Control Unit adopted this saying in order to convey a positive message of consistent professional instruction during our daily training events. Our Advanced Training Unit believes that professionalism and respect are the keys to honor. In 2013 Zipfizz, adopted the saying “Kia-Kaha,” for their Domestic Violence charity event, “Kia Kaha…Rise Above Domestic Violence!” Seattle Police and zipfizz Incorporated and MKG want to share in giving back to the community. The Kia Kaha charity event will further the SPD mission of fighting crime, reducing fear and building community by empowering community members with self defense skills, raising awareness of domestic violence and domestic violence resources, and raising funds for domestic violence related charities. We say “Kia Kaha” as a daily greeting and a goodbye. We use this term to remind each other to stay strong, both physically and mentally, in our everyday lives. Kia Kaha has become a symbol and saying used to promote strength, honor and integrity. The event is on October 19, 2013 at the Seattle Police Athletic Association Pavilion, 11030 East Marginal Way S, Tukwila, WA 98168. This event will begin with registration at 10:00a.m. Training will be between 11:00 and 1:00pm. MKG Seattle is dedicated to offering high quality self defense training workshops and community service as requested.